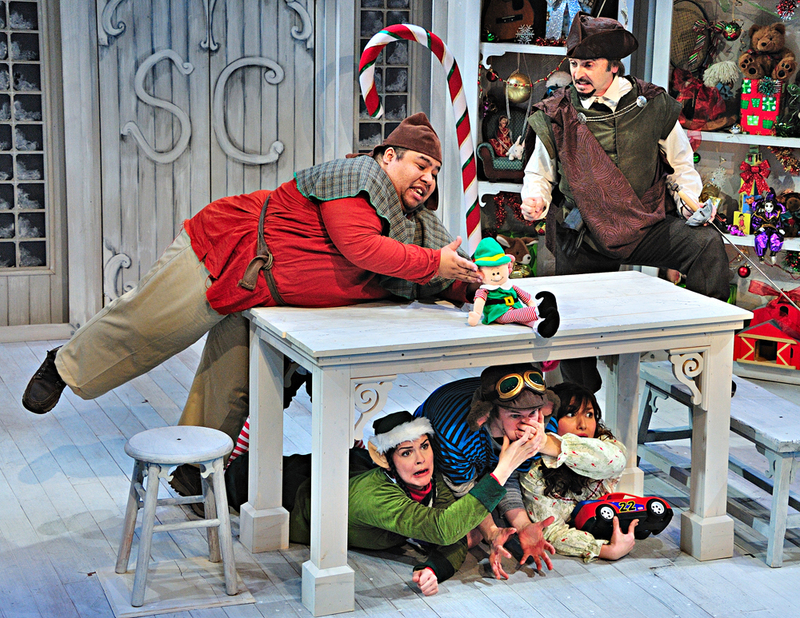 Our family experienced a milestone when we went to see ‘Twas the Night Before Christmas, the holiday production currently running at Glen Echo Park’s Adventure Theatre: It was the first time ever that not-quite-three-year-old Sasha watched a play in its entirety without getting antsy and asking to leave. Instead, she sat through the hour-long performance utterly captivated by it all — the adventurous tale, the enchanting set, the playful musical numbers. All of it spliced together perfectly to produce a show that’s wonderfully entertaining for all ages. The play is based very loosely on the famous Clement Clarke Moore poem, so loosely that other than its recitation in the opening scene and a stirring mouse (who is literally stirring cookie batter when he’s introduced), the title is as far as the association goes. But the story does, indeed, take place the night before Christmas, which sets the scene for one wild and whimsical holiday adventure. It begins as we meet Uncle Brierly in the cozy living room, complete with twinkling Christmas tree and festively decorated bookcase-lined walls, as he gets ready to read “‘Twas the Night Before Christmas.” He barely gets through the first verse when Amos the stirring mouse, then his best friend Emily, burst in to reveal their own version of Christmas events the previous year when Santa skipped their house. When Uncle Brierly shuns their story and exits the room, Calliope, the Jewish elf from the North Pole, arrives to confirm that the two are telling the truth — Santa did skip their house last year — and seeks their help to prevent it from happening to even more houses this year, an entreaty relayed through a fun, chuckle-inducing “Santa Ain’t Coming to Town” rap. And this is when the adventure begins, transporting the characters and the audience from Uncle Brierly’s living room to Santa’s charming little workshop. Shelves stocked with a colorful array of beautiful toys and presents line the whitewashed walls (you could practically see sparks being emitted from the audience as kids’ eyes lit up at the sight of it). But the trio are here on a mission to save Christmas from Sir Guy, the rogue elf who stole and sold Santa’s sleigh to Wal-Mart and just pilfered the Naughty & Nice list with intentions to hawk it to Bloomies. The chase scene and sword fight that follow an exciting hoot. We’re treated to some Three’s Company-esque dramatic irony as Amos’ twin brother shows up and unknowingly helps the operation. And when the heist is thwarted and Christmas is saved, there’s more rapping, and this time a jubilant Santa joins the crew. All in all, it’s an immensely enjoyable show, from the imaginative story and endearing characters to the inspired costumes and brilliant set. That’s not only substantiated by the raves I just bestowed, but also by my daughter’s watershed theatre moment. 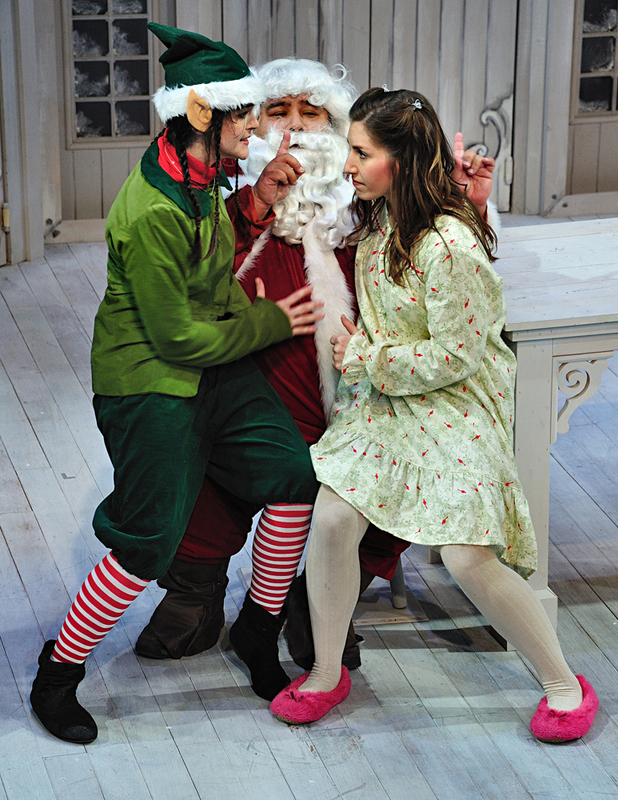 ‘Twas the Night Before Christmas is playing at Adventure Theatre through January 2. Tickets are $18 and available for purchase online and at the Box Office. (Note: tickets sell out quickly and may not be available at the theatre day-of). Disclosure: I received complimentary tickets to the show from Adventure Theatre, but all opinions expressed here are entirely my own. What is the age range this play is suitable for? 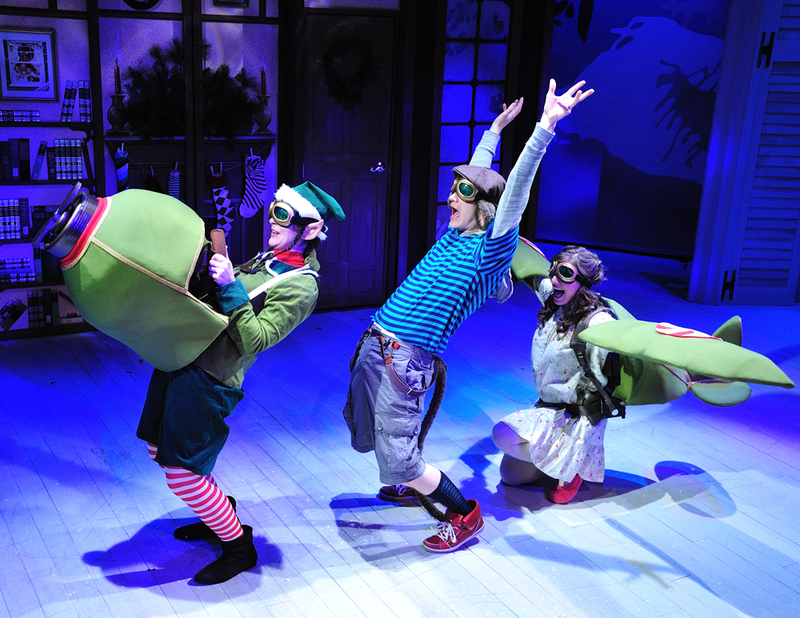 Adventure Theatre recommends it for ages 4 and up, but I think children even younger would enjoy it. My daughter is not even 3 years old, and she loved it.